When it comes to staying healthy and well we tend to think of traditional medicines, and when we think GP prescribing we all picture pills and potions. But a report published this year has highlighted the positive effects of gardening on health and wellbeing and across the country GP’s are starting to prescribe gardening as a method to alleviate physical ailments such as: diabetes, high blood pressure and mental health conditions including dementia and anxiety. This report is supported by the Kings Fund, the National Gardening Society and the, then public health Minister Jane Ellison. The results from some of the studies undertaken are very promising with one survey showing a 19% reduction in anxiety in people that spent time in the outdoors compared to a seven fold increase in people that didn’t. Gardening is a passion of mine, as is working an allotment and growing my own, this has led to many friendships, ideas and health recipes over the years. 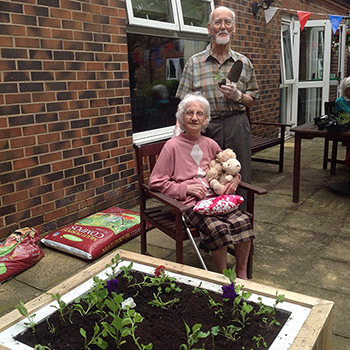 At Anchor we have numerous gardening schemes in place across our services to help and support social isolation, physical and mental wellbeing. The team I work in is a very privileged position, we get to observe the practices in our residential care homes and seeing residents sat outside with colleagues or family members, enjoying a coffee, tea or wine and tasty piece of cake gives a real sense of person-centred care at its best. It shows caring, understanding colleagues and is a natural activity. 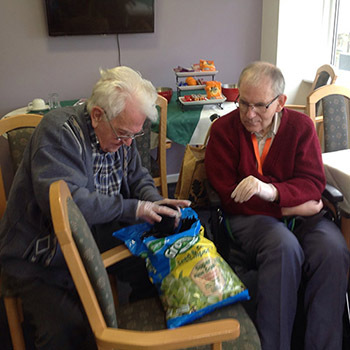 The pictures I have included in this blog show some people I recently met at Firth House care home in Selby, where they have a range of ways for keen gardeners to stay involved with their passion including growing indoor plants and raised flowerbeds. Many older people have enjoyed gardening in the past and still do, they have so many stories and plenty of advice to share. We don’t require large plots of land to develop a garden, some can be neat coordinated areas or an eclectic jumble of colour - just add seating and you’re away. The benefits of being outdoors include: tranquillity, mindfulness, social engagement, physical and mental activity and promotion of sleep. So if you are wondering what to do with a bit of free time, and the sun is out, even just a little, I recommend you chose to spend it outside. Happy Gardening to all customers and colleagues across Anchor!